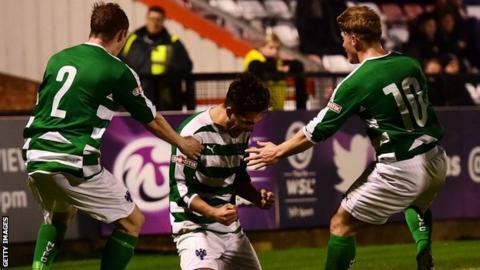 Northwich Victoria showed they can play at a higher level after beating Boreham Wood in their FA Cup first-round replay, according to boss Jim Gannon. The Northern Premier League First Division North leaders won their replay 2-1, with goals from Jordan Williams and Ryan Astles sending them through. They beat a side who are three leagues and 51 places above them. "It's been a fantastic effort and it wasn't just a result, it was the manner of the performance," said Gannon. The 47-year-old told BBC Radio Manchester: "The energy and the quality on the ball meant it was an excellent performance from the lads. "After a nomadic few years, Northwich are enjoying life back in their home town. Under the tutelage of Jim Gannon they are the lowest-ranked side left in the FA Cup and are playing a joyous brand of attacking football which has seen them win 13 league games out of 14. "An ambitious club, they ultimately want to return to non-league's top table where they spent 26 consecutive seasons until relegation in 2005." "As we've seen over the journey in this FA Cup, as each little step has come along we've risen to the challenge and the players have shown they can play at a higher level." The former Stockport, Peterborough and Port Vale boss is now looking forward to the challenge of League Two side Northampton in round two. "It's going to be tough as Northampton are a team flying high in their division," he added. "They're a full-time League outfit and they've got home advantage, so there are a lot of factors against us but we'll set about our business really well for the game - anybody watching tonight means they won't underestimate us."